Library Advocate. : Illustrators Galore -- and many more! Illustrators Galore -- and many more! Thanks to Patrick Nelson, CEO of Mrs. Nelsons Library Supplies, there are now a dozen illustrators who have donated their art in order to promote libraries and support the California Campaign for Strong School Libraries. Artwork is now available on mugs, notecards, T-shirts, and more at the Campaign LIBRARY STORE. New items and artwork is added regularly. Urge your friends, family and book lovers to visit and shop regularly. These are wonderful items for gifts and gift baskets, recognition, and simply fun for your collection. Here are highlights of the four newest artists. Please be sure to thank them all. 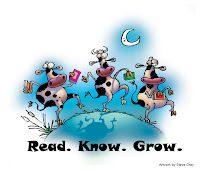 The most recent additions include Steve Gray's two hilarious cow illustrations: Moonlight Cows and Farm Cows. If you are crazy about cows, these images are especially for you. Both images say "Read. Know. Grow." Ben Boos, noted for his Fantasy and Sword illustrations, contributed a fantastic Key and Book image linked with the words "Read. Know. Grow." Underneath the image is a statement to "save California school libraries." Yes! Thank you. Save us! Sophie Blackall has given us a beautiful library scene, with a teacher librarian reading to a class of young students. Across the top, over the tops of the children, are the words "Strong Libraries Build Lifelong Learners" Yes! So true. Tell the story. Sarajo Frieden has given us a fun tree filled with children, reading. Words are "Read. Know. Grow." These words are so perfect for all students, all schools, all readers, all lifelong learners. 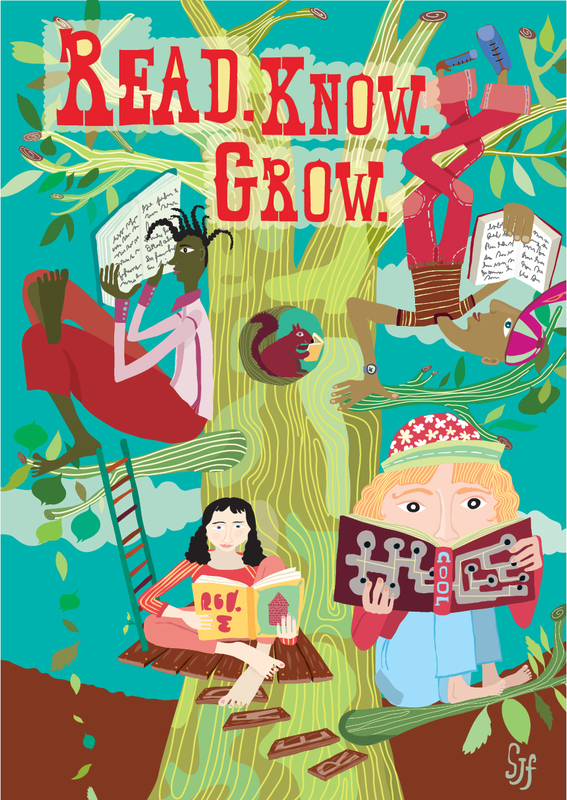 » Kazu Kibuishi says Read.Know.Grow. » Aliki says Read. Know. Grow. » Panda by Caroline Arnold. Read.Know.Grow. » Read.Know.Grow. Art by Joe Cepeda. 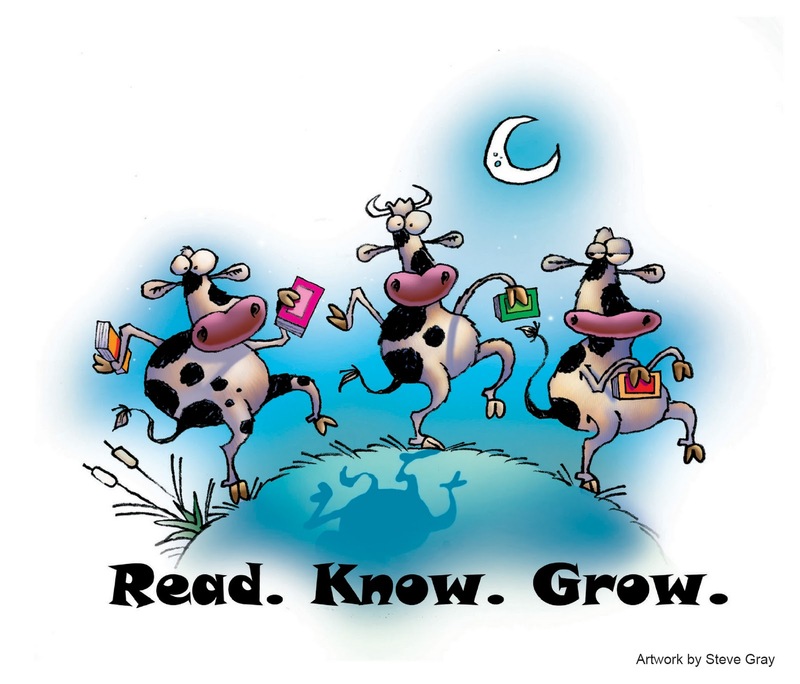 » Read.Know.Grow. Art by Marla Frazee.